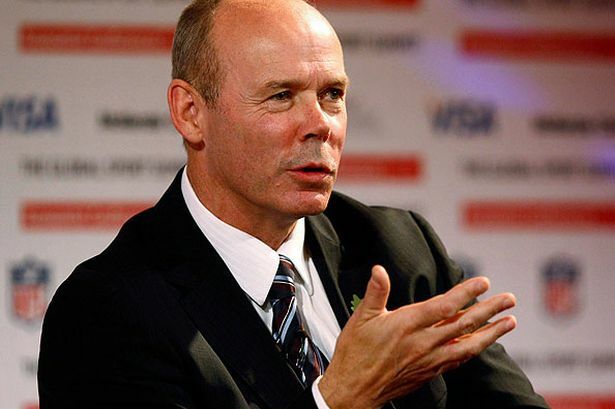 Read this quote a few weeks ago from Sir Clive Woodward, former World Cup winning England coach, that I thought further emphasises my point that rugby’s a simple game that we don’t need to over-complicate. I can’t think that I’ve ever imposed a complicated game plan or even a lot of structure on the players I’ve coached – at any level. I think this is a great way of providing younger players – and even more senior ones – to focus their attack and defence on a basic concept. “Rugby is such a simple game. Defensively you want to slow the ball and have as much time as possible to get your lines organised,” said Woodward. “Offensively it is the opposite. You must play so fast, individually and collectively, that the defence you are trying to break does not have time to think. … couldn’t have said it better myself. Looking at what Clive has said, I can draw a couple of examples for you. Ideally, in attack we want to play the ball quickly to catch the defence disorganised and unaware. This means a strike run has to be determined, support has to be in place, hopefully to keep the move going forward beyond or from contact, or to recycle the ball if contact occurs. Quick ball allows us to go again against defenders not yet ready for us. But if support wasn’t there or their defence was ready on that first phase, and the next players to arrive notice that the ball is emerging slowly and defenders are getting themselves set – something we aim to achieve on defence – trying to play the quick ball (assuming we’ve had to commit more players to secure it, and have to take time to organise a new strike with greater focus) would be playing into their hands. I love to see my team produce quick ball and move the ball quickly from the breakdown, but not when it puts us at risk. Knowing that is our aim, however, rather than having no clear focus between phases should spur on supporting players to bust their butts to get to the break down or into positions to launch the next attack, so that it’s a total effort. We’ll now be flipping our focus to the other side of the ball and working on defence this week. Without focusing too much defence around the break down just yet – which is more fun when you can actually do contact drills (we’re still in a gym) – I’ll be relaying the importance of players working as units. As I’ve mentioned in articles on defence, I really don’t favour a totally flat line in defence so long as the three or four players in front of the ball are not providing obvious gaps and that they’re working together, in communication. It’s that which we’ll be practicing as groups of three work on staying together and communicating responsibility. *BE ACCOUNTABLE! Don’t count passes that arc unnecessarily, are slow, wobble, or are off target. *Three defenders are required to form up at a designated ‘ruck’ area, nominate their responsibilities and work as a team to catch the attackers behind the gain line. *Attackers pass the ball wide to the first receiver or short to a trailing strike runner, to which defenders must adjust. … adding “Squeeze” / A-B-C.
**Post, three things which still need work (trends) and five things that were great! I video taped the dynamic and conditioned defence attack scenarios from last week’s session and posted them for the athletes to see, with my constructive commentary on the good points and those which could be improved upon. This week, the final of our ‘attack’ sessions before transitioning into defence, I’m giving the players the opportunity to tie it all together and have a go in more realistic conditions. As mentioned earlier in this blog, I’m a huge proponent of using video. We operate in such a dynamic game that even seasoned coaches can’t spot all the subtle elements that lead to succes / failure and it’s helpful to go back and review. As these last three sessions were building upon one another, I also forgot to stress the finer points of the ‘big concepts’ I kept harping upon – I’d constantly remind them that quality passing was the foundation of effective attack and that preservation of space was key, but probably didn’t stress enough HOW to achieve that – especially as there were some who weren’t at those early sessions. So I’ll be revisiting those basics at the start, hopefully serving as a reminder as the players head into the final two dynamic scenarios because space still won’t be plentiful, so they’ll have to maximise on the things I’ve taught – timing of the pass / run, straight running lines, sudden and deliberate strike runs, etc. – to get through the toughest defence they’ve seen yet. 0-10 Mins Re-cap from Last Session:1. Ball carrier must be and remain a threat.2. All must take responsibility for scanning and communicating opps. 3. Execution must be calculated and determined (purpose to lines, 100% commitment). Ball carrier has to sort out own positioning and communication (“standing”, “running” … “ball now!”). ROOM FOR THREE OR FOUR? 5 (+1) v 3 (+1)Attackers: Your choice, scan / plan. Light contact to power step / fend / offload / screen pass is all fine. Crash balls will be whistled dead. Advise SH, three up, two behind.Defenders: With bags, style is your choice. Play together or be sneaky. Sweeper can act as a 7, 9 or 15 – no bag. In each of the drills, I will try and let the pre-drill prep be the guidelines the players follow and use themselves to analyse how well they’re doing. As noted in the plan, I want the players to stay with the same group the whole session (pref. people who play alongside each other on the field – tight five, back row, inside backs, outside backs, etc.). It is hoped that they will not only gain a better sense of each other’s abilities and develop cohesion within their units, but also take the opportunity between cycles to analyse their own progress, or that of others, to apply that feedback to their own knowledge. I don’t expect my suggested communication to come right away, but I hope the players will begin to take on short and common phrases to insure information is passed and processed quickly. 1. To every action, there should be a predictable reaction from the defence that provides opportunities. 2. Where there is no / a slow reaction, you have an even greater advantage. Learn to scan for and recognise opportunities. 5 mins Unders / 5 mins OversSH Cycle Drill… versus real defenders. Set, 2. Call for the ball, 3. Execute, 4. Turn and watch. 5. Play defence. 30-35 mins Reactions to Moves A well executed move will either allow you get through the defence, or manipulate it enough to provide opportunities for other players.Slo mo demos …… how does width, depth, timing affect? 35-50 mins Create Space, Support Teams of 5 v 3 good defenders.FILM! Defenders will have bags, passing from contact will be allowed, but stopping forward momentum ends turn. In such a situation, a ‘successful’ end to the drill requires someone to help the ball carrier and secure the ball as if a ruck / maul were being formed. WE DO NOT LEAVE BALL CARRIERS ALONE IN CONTACT! * Recognisable actions – i.e. head down = kick? Attackers start blind, turn and someone must recognise and communicate opportunity in a 5 v 3 situation. 85-90 mins Debrief Watch film, next week will be dynamic skill situations and Touch?